I didn't have really any expectation going into The Fame Game, but it was better than I thought. 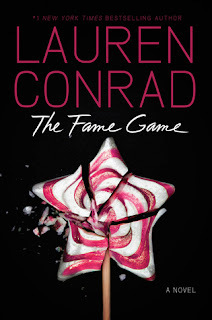 I still haven't read Lauren's first trilogy, L.A. Candy, so I wasn't familiar with Madison Parker's character, or any other of the characters from the first trilogy, that I've seen other reviewers talk about. That aside, the characters, old and new, were not that hard to get to know. They're a bit flat, especially Madison and Gaby, they don't seem much more than a pretty face. The other characters had more depth to them, but not by much. I was somewhat surprised how well Lauren's writing was, I guess I expected it to be a little sloppy, since she's a celebrity author, and most of them can't write worth a crap. The writing is simple, to the point, and easy to read. I think this is one of the fastest books I've ever read, I read it in almost a day. I love the story line. I loved watching Mtv's The Hills when it was on, so it was kind of cool reading this and seeing what really probably happens behind the camera and "reality" tv. The Fame Game is a fun read. It's a good book to read on a rainy day when you just want something normal to read, and get a break from the paranormal, dystopian, other genres that everyone's been reading lately. I am going to definitely be getting the second book when it comes out.